Many patients present to the office with a newer onset "dark spot" on their foot or under their toenail. They often times state that this has become larger, raised or changed in shape. The dark spot is often located on the bottom of the foot, but patients also have noticed a darkened line under their toenails that do not seem to grow out with growth of the toenail. These spots or changes are often associated with melanoma in the foot. Melanoma is a rare clinical entity in Caucasians, accounting for only 2 - 8% of melanoma cases in white patients. 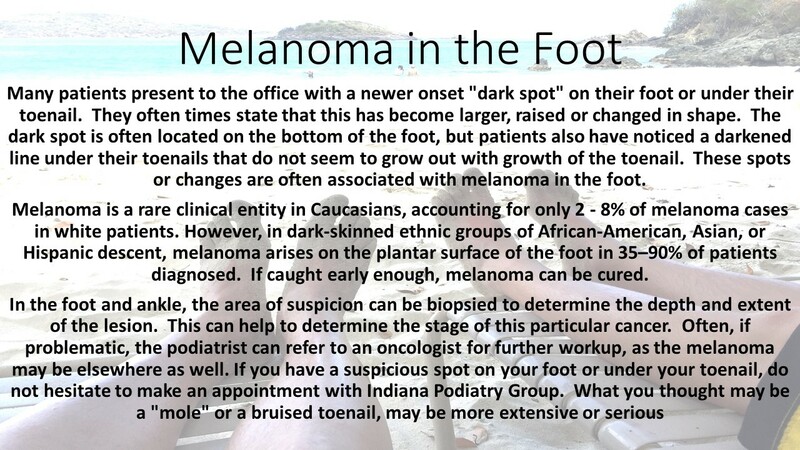 However, in dark-skinned ethnic groups of African-American, Asian, or Hispanic descent, melanoma arises on the plantar surface of the foot in 35–90% of patients diagnosed. If caught early enough, melanoma can be cured.